NEW BRITAIN - The Central Connecticut State football team turned in its best performance of the season - at least on offense - last week, resulting in a seventh-straight conference win. The Blue Devils (3-3, 1-0 NEC) would certainly like to keep it going, especially with the remaining schedule filled with important games. The defending Northeast Conference champions continue their six-game conference stretch this afternoon at Bryant (4-1, 2-0). “I think our guys are excited for the challenge,” CCSU head coach Pete Rossomando said. And Rossomando knows the type of issues the Bulldogs present. Not only does Bryant rank first in the Northeast Conference in total offense (429.2 yards per game), sacks (17) and interceptions (5), as well as second in scoring offense (33.8 points per game), Rossomando voted for the Bulldogs to win the league in the preseason poll. That’s because Bryant has plenty of playmakers. Quarterback Price Wilson is completing 66.3 percent of his passes for a conference-leading 1,445 yards and 15 touchdowns to just six interceptions. His top three receivers - Jean Constant, Vincent Nisivoccia and Shelton McNeal - all have at least 16 catches for 215 yards and two touchdowns. Constant leads the team with six scores. Brenden Femiano is the team’s top rusher with 330 yards on 71 carries. Defensively, defensive end Tomas Wright and linebacker Thomas Costigan form a tough duo. Wright leads the nation with 7.5 sacks and has 12.5 tackles for loss, including 5.5 and 8.5, respectively, in the last two games. Costigan has a team-high 49 tackles - 20 more than the next closest, Wright - to go along with three sacks of his own. Zahir Williams, meanwhile, leads the Bulldogs with two interceptions. 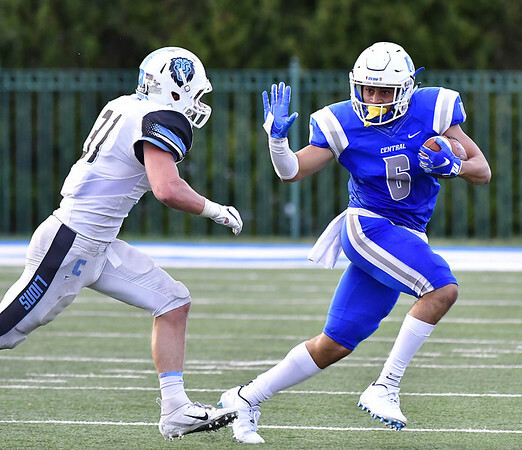 It will be a good test for a CCSU offense that collected an NEC-record 699 yards of offense, including 358 on the ground, last week against Robert Morris. Both Drew Jean-Guillaume and Aaron Dawson topped the century mark. Bryant’s defense, however, has given up some big plays and some points this season. The lowest total an opponent has scored against the Bulldogs this season was 20 by Duquesne last week. The Blue Devils’ defense will have its own work cut out for it as well. In addition to stopping Wilson and the passing game, the unit will have to prepare for a number of trick plays. Bryant runs about three a game, according to Rossomando, with as many as 10 different ones in the Bulldogs’ playbook. But as much as Bryant has filled up the stat sheet this season, it’s also coming into the matchup with plenty of confidence. The Bulldogs are coming off a win over traditional NEC-power Duquesne, a game in which their defense came away with four red zone turnovers. Bryant’s lone loss this season was to No. 21 Stony Brook, which it led 21-20 midway through the third quarter until the Seawolves scored 30 unanswered points. Outside those two games, the Bulldogs have been able to score relatively easily. It will just be a matter if CCSU is up for the challenge. Posted in Newington Town Crier, Newington on Friday, 12 October 2018 20:27. Updated: Friday, 12 October 2018 20:29.